SnapSeaarch (formerly known as PharmaHood Consultants) operates as an extended HR arm for its clients, providing Recruitment services to MNCs and Business Conglomerates across India, Africa & Middle East. The organization was founded in 2003 for serving mainly the Healthcare sector and has since grown the company in this decade’s time to serve 17 different industry verticals today. Today SnapSeaarch is amongst the “Top 3 Preferred Recruitment Services Partner” for its long-standing clients. SnapSeaarch has been known in the executive search names through its Process, People and Passion to mark a difference in each and every assignment takes up. All 3 Ps at SnapSeaarch marks difference with their quality uncompromised for the entire process. At SnapSeaarch, recruitment is a science and handled with utmost care. Best known for the ability to understand and bridge the gap between candidate abilities and corporate needs thereby becoming instrumental in changing talented individuals into human assets, SnapSeaarch is the first choice for any niche hiring and for Executive Search Services irrespective of the industry or sector. SnapSeaarch is in the midst of another record setting year to get covered in the Consultants Review Magazine as the pioneers in the Recruitment industry. We have been recognized as “India’s 10 Most Promising Recruitment Consultants-2018” in the Consultant Review Magazine March 2018 edition. Our Key to Success is Customer Satisfaction through Faster Turn-around Time coupled with Higher Conversion Ratio.SnapSeaarch holds expertise in serving clients from varied industries, including Pharma, Healthcare, Medical Devices, Engineering/Manufacturing, Construction, Logistics & Supply Chain, Textiles, Chemical, Oil & Energy, FMCG, Retail, Automotive Service, Hospitality, Real Estate, and IT. SnapSeaarch has been improvising on its service delivery over these years and today it has carved a niche over its competitors by providing a differentiating factor at every step of the recruitment cycle. Over the years, we have grown from being just a Recruitment Services Provider to “One of the Top 3 Preferred Recruitment Services Partner” for our long-standing clients. We have been recognized as “India’s 10 Most Promising Recruitment Consultants-2018” in the Consultant Review Magazine March 2018 edition. The Legendary journey of Pharmahood to SnapSeaarch has got acknowledgments of its uncompromised quality in their products through its long-standing client associations since decades. 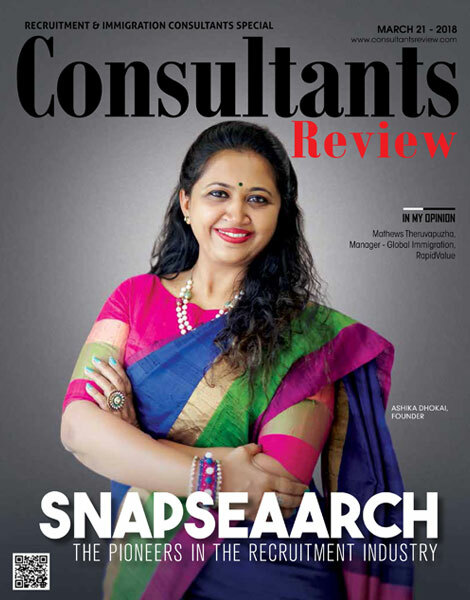 SnapSeaarch is proud to get another testimonial for its niche process of recruitments – We have been recognized as “India’s 10 Most Promising Recruitment Consultants-2018” in the Consultant Review Magazine March 2018 edition.